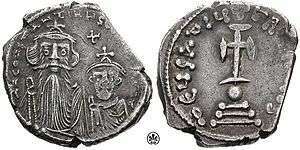 Constans II (Greek: Κώνστας Β', Kōnstas II Latin: Heraclius Constantinus Augustus or Flavius Constantinus Augustus); 7 November 630 – 15 September 668), also called Constantine the Bearded (Kōnstantinos Pogonatos), was emperor of the Byzantine Empire from 641 to 668. He was the last emperor to serve as consul, in 642. 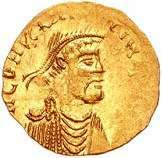 Constans is a diminutive nickname given to the Emperor, who had been baptized Herakleios and reigned officially as Constantine. The nickname established itself in Byzantine texts and has become standard in modern historiography. Constans was the son of Constantine III and Gregoria. Due to the rumours that Heraklonas and Martina had poisoned Constantine III, he was named co-emperor in 641. 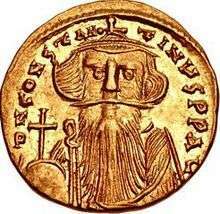 Later that same year his uncle was deposed, and Constans II was left as sole emperor. Under Constans, the Byzantines completely withdrew from Egypt in 642, and Caliph Uthman launched numerous attacks on the islands of the Mediterranean Sea and Aegean Sea. A Byzantine fleet under the admiral Manuel occupied Alexandria again in 645, but after a Muslim victory the following year this had to be abandoned. The situation was complicated by the violent opposition to Monothelitism by the clergy in the west and the related rebellion of the Exarch of Carthage, Gregory the Patrician. The latter fell in battle against the army of Caliph Uthman, and the region remained a vassal state under the Caliphate until civil war broke out and imperial rule was again restored. Constans attempted to steer a middle line in the church dispute between Orthodoxy and Monothelitism by refusing to persecute either and prohibiting further discussion of the natures of Jesus Christ by decree in 648. Naturally, this live-and-let-live compromise satisfied few passionate participants in the dispute. In 654, however, Muawiyah renewed his raids by sea, plundering Rhodes. Constans led a fleet to attack the Muslims at Phoinike (off Lycia) in 655 at the Battle of the Masts, but he was defeated: 500 Byzantine ships were destroyed in the battle, and the Emperor himself was almost killed. Before the battle, chronicler Theophanes the Confessor says, the Emperor dreamed of being at Thessalonika; this dream predicted his defeat against the Arabs because the word Thessalonika is similar to the sentence "thes allo niken", which means "gave victory to another (the enemy)". Caliph Uthman was preparing to attack Constantinople, but he did not carry out the plan when the first Fitna broke out in 656. Now Constans could turn to church matters once again. Pope Martin I had condemned both Monothelitism and Constans' attempt to halt debates over it (the Type of Constans) in the Lateran Council of 649. Now the Emperor ordered his Exarch of Ravenna to arrest the Pope. Exarch Olympius excused himself from this task, but his successor, Theodore I Calliopas, carried it out in 653. Pope Martin was brought to Constantinople and condemned as a criminal, ultimately being exiled to Cherson, where he died in 655. The Chinese dynastic histories of the Old Book of Tang and New Book of Tang mention several embassies made by Fu lin (拂菻), which they equated with Daqin (i.e. the Roman Empire). These are recorded as having begun in the year 643 with an embassy sent by the king Boduoli (波多力, i.e. Constans II Pogonatos) to Emperor Taizong of Tang, bearing gifts such as red glass and green gemstones. Other contacts are reported taking place in 667, 701, and perhaps 719, sometimes through Central Asian intermediaries. These histories also record that the Arabs (Da shi 大食) sent their commander "Mo-yi" (Chinese: 摩拽伐之, Pinyin: Mó zhuāi fá zhī), to besiege the Byzantine capital, Constantinople, and forced the Byzantines to pay them tribute. This Arab commander "Mo-yi" was identified by historian Friedrich Hirth as Muawiyah I (r. 661-680), the governor of Syria before becoming the Umayyad caliph. The same books also described Constantinople in some detail as having massive granite walls and a water clock mounted with a golden statue of man. The Byzantine historian Theophylact Simocatta, writing during the reign of Heraclius (r. 610–641), relayed information about China's geography, its capital city Khubdan (Old Turkic: Khumdan, i.e. Chang'an), its current ruler Taisson whose name meant "Son of God" (Chinese: Tianzi, although this could be derived from the name of Emperor Taizong of Tang), and correctly pointed to its reunification by the Sui Dynasty (581-618) as occurring during the reign of Maurice, noting that China had previously been divided politically along the Yangzi River by two warring nations. ↑ Warren Treadgold, Byzantium and Its Army 284-1081 (Stanford: Stanford University Press, 1995). pp. 23-25;72-3. 1 2 3 4 5 Hirth, Friedrich (2000) . Jerome S. Arkenberg, ed. "East Asian History Sourcebook: Chinese Accounts of Rome, Byzantium and the Middle East, c. 91 B.C.E. - 1643 C.E.". Fordham.edu. Fordham University. Retrieved 2016-09-10. ↑ Mutsaers, Inge. "Ashgate Joins Routledge - Routledge" (PDF). Gowerpublishing.com. Retrieved 2016-09-10.